The Kansas City Chiefs release one of their star players, but only after TMZ releases a video of him kicking a woman. Is the NFL still fumbling the ball on domestic violence? Deborah Epstein, professor of law and co-director of the Georgetown University Law Center’s Domestic Violence Clinic (@GeorgetownLaw). For four years, she headed the NFL Players Association’s commission on domestic violence, until she resigned in May. 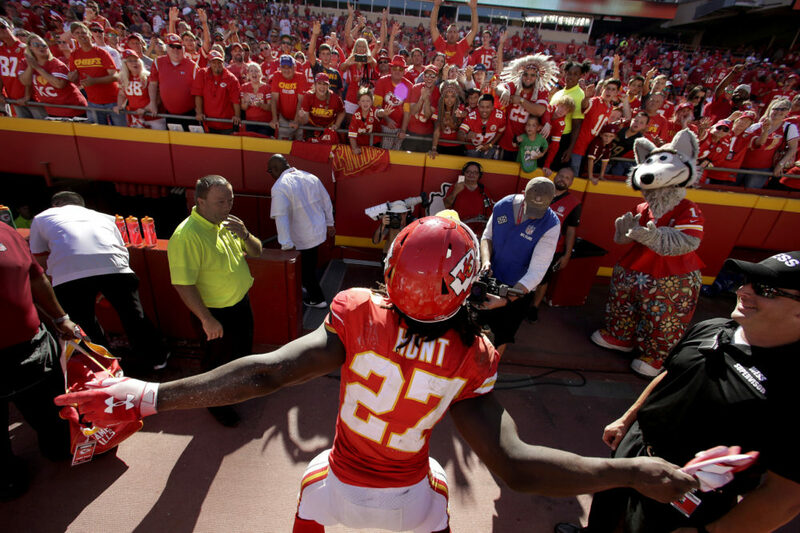 New York Times: "Kareem Hunt Is Cut by the Chiefs After a Video Showed Him Attacking a Woman" — "The Kansas City Chiefs cut their star running back, Kareem Hunt, on Friday, shortly after the N.F.L. suspended him in response to the release of a video that showed Hunt knocking a woman down and kicking her at a hotel in February. "Hunt is one of the most prominent players on a contending team to lose his job in the middle of a season because of an incident involving violence against a woman. "The video was recorded at the Metropolitan at the 9 hotel, in downtown Cleveland, where Hunt has an apartment. The police were called after the February incident, but no arrests were made and no charges were filed. "But the graphic video’s release on Friday forced the hands of the league and the team, both of which had been unable to get the footage as part of their investigation, according to Brian McCarthy, a spokesman for the N.F.L." Yahoo Sports: "NFL should leave you feeling sick after recent revelations involving Kareem Hunt, Reuben Foster" — "I’m sick of it all. "The excuses. The apologies. The fake outrage. "Most of all, though, I’m sick of the hypocrisy. "From the NFL. From team executives. From a large swath of fans. "Four years have passed since the infamous Ray Rice video, and we have learned nothing. "We are no better. And, sadly, neither is the league. "The events of the past week — the Washington Redskins’ imprudent decision to claim Reuben Foster three days after he was arrested on a domestic-violence charge and the Kansas City Chiefs’ dismissal of Kareem Hunt nine months after he shoved and kicked a woman — were proof of a larger, more insidious disease that has taken root in the way the NFL conducts its business." Washington Post: "I’m done helping the NFL Players Association pay lip service to domestic violence prevention" — "On May 23, I resigned from the NFL Players Association’s commission on domestic violence. Susan Else, former president of the National Network to End Domestic Violence, resigned with me. I simply cannot continue to be part of a body that exists in name only. "My resignation brought to an end a nearly four-year association with the NFLPA that was, by turns, promising, inspiring and deeply frustrating. The commission was formed as part of the sport’s belated effort to confront the plague of domestic violence in the National Football League. The precipitating event was, of course, the viral release of a security video from an Atlantic City casino showing then- ­Baltimore Ravens running back Ray Rice knocking his then-fiancee unconscious in an elevator and then dragging her through the doors. "When representatives of the players association approached me with the idea of organizing an official effort to study and rectify the NFL’s domestic violence epidemic, I was thrilled. Several years ahead of the #MeToo awakening in American professional life, I believed the commission, as a project sponsored by an organization representing the players themselves, would be positioned to address head-on the serious problem of intimate-partner violence among NFL couples and families." SB Nation: "Opinion: When it comes to domestic violence, stop expecting NFL teams to do the right thing" — "On the evening of Tuesday, November 27th, linebacker Reuben Foster was claimed off waivers by Washington. Mere days earlier he’d been let go by the San Francisco 49ers after being arrested and charged with domestic violence while traveling with the team to Florida. It was Foster’s second arrest for domestic violence (charges were dropped the first time), and third arrest of 2018. "Sadly, the move by Washington to pick up Foster was neither surprising nor unprecedented. The NFL has a long and torrid history of enabling men accused of domestic violence; Foster is simply the latest example. "The rightful outrage that follows each instance consistently has the same undertone of despair. How could this be happening again? How can the league continue to get this oh, so very wrong? Men hit women, NFL teams look the other way, we cry out, and the game plays on, until the next woman suffers a blow from a man emboldened by the cradle of the league. Then we begin the process anew." Sporting News: "NFL could run with ball on domestic violence, but chooses not to" — "Looks like it’s Unaccountability Week in the National Football League. Is there a special color the players wear for that? "Everything this $13 billion sport has done since midweek has shown the world that it couldn't care less about getting a grip on domestic violence in its ranks, but is more interested in looking like it's getting a grip on it. "If the NFL really wanted to handle it, help its players, help their victims and help its own image, it wouldn’t govern by TMZ video. League officials wouldn’t be the kings of reaction, instead of proaction. "The Kareem Hunt mess from nine months ago would have been resolved, or on its way to being resolved, for him, the Chiefs and the NFL, long before Friday night — long before they all scrambled to cover their rear ends after the video of Hunt shoving, manhandling and kicking a woman in a Cleveland hotel. "But they all failed, the same way, almost to the letter, in how the league failed with Ray Rice in 2014, and with Josh Brown in 2016. Suddenly, everyone found their spines, only when evidence of those players’ deeds and words went public (in Brown’s case, not visual evidence, but police reports). "Does anyone doubt, then, that everyone will have that same epiphany on Reuben Foster only if some visual proof surfaces about him? Washington played the 'due diligence' game when it claimed him off waivers after his latest arrest. It’s completely fair to question whether the Chiefs played the same game in February, since now they're claiming that Hunt’s failure was in lying to them, indicating that their investigation started and stopped with them asking him what happened and taking his word for it." This program aired on December 4, 2018.